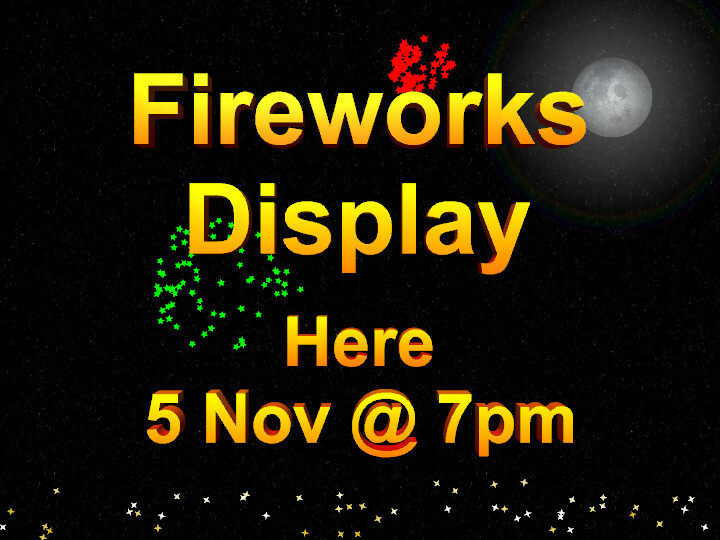 Advertise a fireworks display at your pub, club or venue with this downloadable template. Use it as part of a rolling playlist to eye-catching advertisements for all your up-and-coming events. On selecting this template within the CyberFlair 3D Impressions Studio, the Template Wizard will offer you to customize the display information. Once chosen, it's ready to use. Play the animation on a large screen TV directly from your computer or laptop. Alternatively, use the movie creation feature to export a movie clip that can be used to make a DVD or played on a games console or media player. To create a DVD, you will need 3rd-party DVD creation software, such as the 'Windows DVD Maker', supplied free with most versions of Microsoft Windows. To play the animation on a games console or media player, the device must support the movie file format that CyberFlair 3D Impressions creates or you can use the free conversion tool, available by clicking here. Keywords: fireworks, bonfire night, Guy Fawkes, rockets, sparkler, event, display, organised, organized.